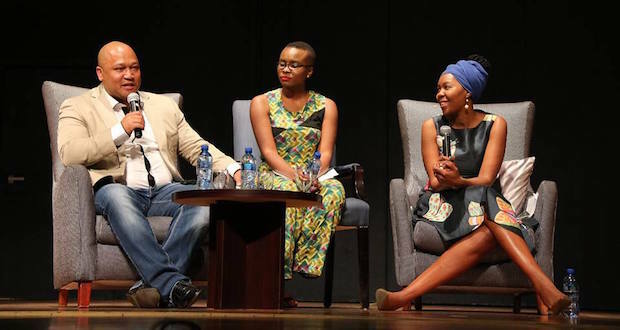 On Monday evening, hundreds gathered at Wits University’s Great Hall to hear Ruth First fellows Panashe Chigumadzi and Sisonke Msimang speak on race relations in South Africa. PONTSHO PILANE sums up the five biggest take-home points from the lecture. 1. Black women are here to stay â€“ and to slay! In both their talks, Chigumadzi and Msimang referenced various black women who are emerging voices within the South African discourse. â€œI chose this genre because I wanted to signal that there is a new generation of contemporary thinkers – people like Milisuthando Bongela, Danielle Bowler, TO Molefe, and others who are cited in this work, whose words are as much a window into this countryâ€™s collective soul as those of Gordimer or Coetzee or Paton,â€ Msimang said. The existence of white privilege is one that is highly contested â€“ usually by those who benefit from it but, Msimang said, it is the responsibility of both black and white people to pursue true reconciliation and authentic interracial friendships. Many vehemently agreed when Msimang suggested that we need to move away from the original version of the Rainbow Nation, into what she calls Rainbow 2.0.
â€œIf we are to replace the distorted idea of the rainbow with a more honest but no less aspirational vision of dignity and respect, whites will need to give up their ideological and practical specialness and they will also have to reject the increasingly irrelevant, weepy and unhelpful mythology of Rainbowism.â€ said Msimang. During a brief Q&A after the lecture, Mbe Mbhele, a Wits student, expressed his anger and questioned why the event commemorates a white woman like Ruth First, instead of the likes of Robert Sobukwe. But Chigumadzi disagreed with McKaiser and said that the anger and pain of black people cannot be policed or expected to look a certain way. â€œBlack pain is not an academic thing, it’s an everyday thing,â€ she said. Chigumadzi and Msimang disagreed on whether black people and white people in South Africa can have real, meaningful relationships. â€œI am not interested in having white friends or non-racialism at this stage. It cannot be fully achieved while we demand for our land back,” Chigumadzi said. Msimang however said she will keep striving for authentic interracial relationships. You can listen to the full discussion on the Wits Journalism site. Pontsho Pilane is the Jo'burg reporter for The Daily Vox. Her interests include issues of gender, class and racial identity in South African media. If the young man’s insistence that a white woman who gave her very life for the emancipation of black people is not worthy of recognition is not enough, then the general sitting around and anthropomorphising about “whites” is proof that for a sector of SA intellectual life anti-white racism is the new rallying cry. Why don’t you go and live under Mugabe or in the DRC you appalling bunch of hypocrites. Thank you for this comment. Onviously I have not heard the entire talk, but the article is clearly written in a biassed and naive manner.